Our Super-Slim New iPad Air 2 Leather Case is one of our newest editions to the Pipetto Classics range. Our Super-Slim New iPad Air 2 Leather Case offers the best fully-protective Leather iPad Smart Covers for your new iPad Air 2. This multi-foldable "Origami" Style Smart cover is handcrafted from Italian Saffiano Leather, lined with a luxury grey PU pigskin lining, and finished with a protective snap-in soft-touch shell to protect against the knocks and bangs of everyday life. Gently snap in your iPad Air 2 into our soft-touch shell for dual viewing angles ideal for FaceTime, Movie watching or Skype calls. The wide base is an additional feature that we love, as it's perfect for viewing movies on uneven or soft surfaces (i.e. in bed or on the sofa) when you're relaxing. The smart cover feature in this iPad Air 2 Case puts your iPad Air 2 into sleep mode & extends your battery life by up to 20%. We're confident you'll love our Origami iPad Air 2 Case, but if for any reason you don't think they're as great as we do, we offer a 14 day return policy and a lifetime warranty. 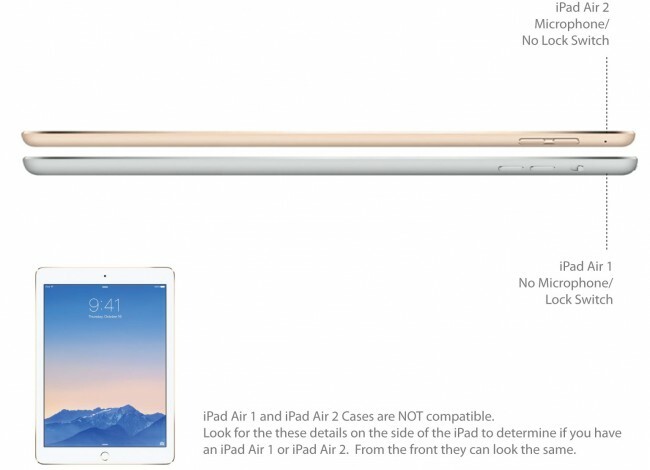 Designed for the iPad Air 2. 100% Handcrafted Italian Leather. * Smart Cover Functionality (2 Viewing Angles - Typing/Standing) + Plus additinonal "Origami" Stand position for additional wide base support. * Smart Cover function Extends your battery life by up to 20%!